Designed to address the challenges of DTV tuner testing, the LG 3803 provides all of the signal control necessary for testing the performance of ATSC compliant tuners and receivers. The RF output can be set to emulate 8VSB, 64 and 256QAM modulation formats and the modulation frequency can be set from 50MHz to 900MHz covering the entire VHF and UHF spectrum. Output level ranges from -100 to +13dBm (50 Ohm) and it is settable with 0.1dB resolution; ideal for doing input sensitivity tests. 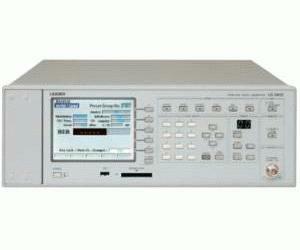 A pseudo-random (PN) generator and a BER counter are built into the instrument and facilitate easy BER measurements in a single unit. The instrument can be modulated internally (2 built-in test patterns; color bars and ramp) or can be externally modulated (DVB-ASI or SPI input). An optional DVD drive is available to supply moving video playback for HD rates; an excellent way to test receivers in a real life simulation. The QVGA display provides easy instrument control. The instrument can be Ethernet controlled. Remote control allows preset recall and increment; up to 100 presets can be set up and recalled aiding in the automatic testing process.